In 1861, Mark Twain's (real name Samuel Clemens) brother Orion was named Secretary of Nevada Territory. Twain joined his brother for the trip west. (Some contend the young Twain deserted from the Confederate Army to do so.) Eleven years later Twain described his journey in the book Roughing It. Although its approach is humorous, the book's descriptions are accurate. As Twain notes in his preface, "...there is information in the volume; information concerning an interesting episode in the history of the Far West, about which no books have been written by persons who were on the ground in person, and saw the happenings of the time with their own eyes." The movies create an idyllic impression of riding the overland stage - smooth travel in roomy comfort. Twain paints a much different picture - passengers crammed together with mailbags, jostled by every bump, breathing dust, and at the mercy of Mother Nature. However, for its time, the stagecoach offered the latest technology in travel, carrying its careening passengers across the Western Plains at speeds greater than any other transport available. 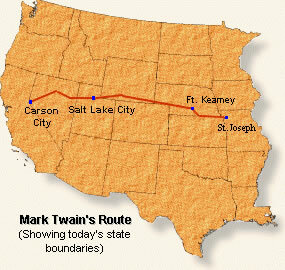 Twain begins his journey in St. Joseph, Missouri, the starting point for the overland route to Sacramento, California. Twain and his brother Orion discover that passengers are limited to only 25 ponds of baggage. After shedding much of their luggage, the intrepid travelers are on their way across the plains of Kansas. matter, and passengers. We three were the only passengers this trip. We sat on the back seat, inside. About all the rest of the coach was full of mail bags - for we had three days' delayed mail with us. Almost touching our knees, a perpendicular wall of mail matter rose up to the roof. There was a great pile of it strapped on top of the stage, and both the fore and hind boots were full. We had twenty-seven hundred pounds of it aboard, the driver said - 'a little for Brigham, and Carson, and 'Frisco, but the heft of it for the Injuns, which is powerful troublesome 'thout they get plenty truck to read.' But as he just then got up a fearful convulsion of his countenance which was suggestive of a wink being swallowed by an earthquake, we guessed that his remark was intended to be facetious , and to mean that we would unload the most of our mail matter somewhere on the Plains and leave it to the Indians, or whosoever wanted it. We changed horses every ten miles, all day long, and fairly flew over the hard, level road. We jumped out and stretched our legs every time the coach stopped, and so the night found us still vivacious and unfatigued." The next day, the stage suffers a breakdown forcing its passengers to evacuate while repairs are made. The conductor lays the blame for the mishap on the extra weight of too many mailbags. After throwing half the mail onto the prairie, the stage resumes its journey. Orion's large Unabridged Dictionary causes trouble along the way. Every time we avalanched from one end of the stage to the other, the Unabridged Dictionary would come too; and every time it came it damaged somebody. One trip it 'barked' the Secretary's elbow; the next trip it hurt me in the stomach, and the third it tilted Bemis's nose up till he could look down his nostrils - he said. The pistols and coin soon settled to the bottom, but the pipes, pipe-stems, tobacco, and canteens clattered and floundered after the Dictionary every time it made an assault on us, and aided and abetted the book by spilling tobacco in our eyes, and water down our backs." Each evening, the stage announces its approach to a way station by the driver blowing a bugle. The way station offers sparse comfort. "The station buildings were long, low huts, made of sun-dried, mud-colored bricks, laid up without mortar (adobes the Spaniards call these bricks, and Americans shorten it to 'dobies. )The roofs, which had no slant to them worth speaking of, were thatched and then sodded or covered with a thick layer of earth, and from this sprang a pretty rank growth of weeds and grass. It was the first time we had ever seen a man's front yard on top of his house. The buildings consisted of barns, stable-room for twelve or fifteen horses, and a hut for an eating room for passengers. This latter had bunks in it for the station-keeper and a hostler or two. You could rest your elbow on its eaves, and you had to bend in order to get in at the door. In place of a window there was a square hole about large enough for a man to crawl through, but this had no glass in it. There was no flooring, but the ground was packed hard. There was no stove, but fire-place served all needful purposes. There were no shelves, no cupboards, no closets. In a corner stood an open sack of flour, and nestling against its base were a couple of black and venerable tin coffee-pots, a tin teapot, a little bag of salt, and a side of bacon. By the door of the station keeper's den, outside, was a tin wash-basin, on the ground. Near it was a pail of water and a piece of yellow soap, and from the eves hung a hoary blue woolen shirt, significantly - but this latter was the station-keeper's private towel, and only two persons in all the party might venture to use it - the stage-driver and the conductor." The passengers eagerly await the spectacle of an encounter with a Pony Express rider racing his load of mail to its next transfer point. Every neck is stretched further, and every eye strained wider. Away across the endless dead level of the prairie a black speck appears against the sky, and it is plain that it moves. Well, I should think so! In a second or two it becomes a horse and rider rising and falling, rising and falling - sweeping toward us nearer and nearer and still nearer - growing more and more distinct, more and more sharply defined - nearer and still nearer, and the flutter of the hoofs comes faintly to the ear - another instant a whoop and a hurrah from our upper deck, a wave of the rider'' hand, but no reply, and a man and horse burst past our excited faces, and go winging away like a belated fragment of a storm! Near Salt Lake City, the stage passes a wagon train filled with Mormons making the trek westward. "Just beyond the breakfast-station we overtook a Mormon emigrant train of thirty-three wagons; and tramping wearily along and driving their herd of lose cows, were dozens of coarse-clad and sad-looking men, women, and children, who had walked as they were walking now, day after day for eight lingering weeks, and in that time had compassed the distance our stage had come in eight days and three hours - seven hundred and ninety-eight miles! They were dusty and uncombed, hatless, bonnetless and ragged, and they did look so tired!" Collins, Richard (ed. ), The American Frontier (1992); Twain, Mark, Roughing It (1872). "Riding The Overland Stage, 1861," EyeWitness to History, www.eyewitnesstohstory.com (1998). Twain's ticket from St. Jo. to Carson City cost $150, equivalent to approximately $2660 in today's dollars. The trip from St. Jo to Sacramento, California could take from 15 to 17 days. The average stagecoach could squeeze 18-20 passengers into it. They averaged 8 mph over good terrain and horses were changed every 12 to 15 miles. Each cost over $1,500 to build. The Pony Express began in 1860 and ended in 1861. Mail was carried in 40-mile relays from St. Jo. to Sacramento in 10 days. The Mormon Trek from the East to Utah began in 1845.